"Arts and crafts" redirects here. For other uses, see Arts and crafts (disambiguation). Batik craftswomen in Java, Indonesia drawing batik. A handicraft, sometimes more precisely expressed as artisanal handicraft or handmade, is any of a wide variety of types of work where useful and decorative objects are made completely by hand or by using only simple tools. It is a traditional main sector of craft, and applies to a wide range of creative and design activities that are related to making things with one's hands and skill, including work with textiles, moldable and rigid materials, paper, plant fibers, etc. One of the world's oldest handicraft is Dhokra; this is a sort of metal casting that has been used in India for over 4,000 years and is still used. Usually the term is applied to traditional techniques of creating items (whether for personal use or as products) that are both practical and aesthetic.Handicraft industries are those that produces things with hands to meet the needs of the people in their locality.Machines are not used. Collective terms for handicrafts include artisanry, handicrafting, crafting, handicraftsmanship and handcrafting. The term arts and crafts is also applied, especially in the United States and mostly to hobbyists' and children's output rather than items crafted for daily use, but this distinction is not formal, and the term is easily confused with the Arts and Crafts design movement, which is in fact as practical as it is aesthetic. Handicrafting has its roots in the rural crafts—the material-goods necessities—of ancient civilizations, and many specific crafts have been practiced for centuries, while others are modern inventions, or popularizations of crafts which were originally practiced in a limited geographic area. Many handicrafters use natural, even entirely indigenous, materials while others may prefer modern, non-traditional materials, and even upcycle industrial materials. The individual artisanship of a handicrafted item is the paramount criterion; those made by mass production or machines are not handicraft goods. Seen as developing the skills and creative interests of students, generally and sometimes towards a particular craft or trade, handicrafts are often integrated into educational systems, both informally and formally. Most crafts require the development of skill and the application of patience, but can be learned by virtually anyone. Like folk art, handicraft output often has cultural and/or religious significance, and increasingly may have a political message as well, as in craftivism. Many crafts become very popular for brief periods of time (a few months, or a few years), spreading rapidly among the crafting population as everyone emulates the first examples, then their popularity wanes until a later resurgence. The Arts and Crafts movement originated as a late 19th-century design reform and social movement principally in Europe, North America and Australia, and continues today. Its proponents are motivated by the ideals of movement founders such as William Morris and John Ruskin, who proposed that in pre-industrial societies, such as the European Middle Ages, people had achieved fulfillment through the creative process of handicrafts. This was held up in contrast to what was perceived to be the alienating effects of industrial labor. Works Progress Administration, Crafts Class, 1935. These activities were called crafts because originally many of them were professions under the guild system. Adolescents were apprenticed to a master craftsman, and refined their skills over a period of years in exchange for low wages. By the time their training was complete, they were well equipped to set up in trade for themselves, earning their living with the skill that could be traded directly within the community, often for goods and services. The Industrial Revolution and the increasing mechanisation of production processes gradually reduced or eliminated many of the roles professional craftspeople played, and today many handicrafts are increasingly seen, especially when no longer the mainstay of a formal vocational trade, as a form of hobby, folk art and sometimes even fine art. The term handicrafts can also refer to the products themselves of such artisanal efforts, that require specialized knowledge, may be highly technical in their execution, require specialized equipment and/or facilities to produce, involve manual labor or a blue-collar work ethic, are accessible to the general public, and are constructed from materials with histories that exceed the boundaries of Western "fine art" tradition, such as ceramics, glass, textiles, metal and wood. These products are produced within a specific community of practice, and while they mostly differ from the products produced within the communities of art and design, the boundaries often overlap, resulting in hybrid objects. Additionally, as the interpretation and validation of art is frequently a matter of context, an audience may perceive handicrafted objects as art objects when these objects are viewed within an art context, such as in a museum or in a position of prominence in one's home. At the Buell Children's Museum in Pueblo, Colorado, children and their guardians partake in "arts and crafts" (i.e. handicrafts). Simple "arts and crafts" projects are a common elementary and middle school activity in both mainstream and alternative education systems around the world. In some of the Scandinavian countries, more advanced handicrafts form part of the formal, compulsory school curriculum, and are collectively referred to as slöjd in Swedish, and käsityö or veisto in Finnish. Students learn how to work mainly with metal, textile and wood, not for professional training purposes as in American vocational–technical schools, but with the aim to develop children's and teens' practical skills, such as everyday problem-solving ability, tool use, and understanding of the materials that surround us for economical, cultural and environmental purposes. Secondary schools and college and university art departments increasingly provide elective options for more handicraft-based arts, in addition to formal "fine arts", a distinction that continues to fade throughout the years, especially with the rise of studio craft, i.e. the use of traditional handicrafting techniques by professional fine artists. Many community centers and schools run evening or day classes and workshops, for adults and children, offering to teach basic craft skills in a short period of time. A hand made sofa set made from fibres extracted from bamboo at a fair in Kolkata. Made by artists of West Bengal, India. Typical Filipino handmade brooms in a restaurant of Banaue Municipal Town. Handicrafts for sale in Mysore, India. A craft done by using twilling papers. ^ Thomas MacMillan (April 30, 2012). "On State Street, "Maker" Movement Arrives". New Haven Independent. Retrieved November 23, 2016. ^ "Gaia Handicraft". Archived from the original on November 23, 2016. Retrieved November 23, 2016. ^ Clark, Alex (18 September 2011). "The hell of handicrafts". The Guardian. Retrieved 22 May 2014. ^ Kumar, Amit (Nov 7, 2011). "Handicraft business: Weaving a career out of handicrafts and empowering the Indian artisans". Economic Times of India. Retrieved 22 May 2014. ^ Filou, Emilie (13 June 2013). "Africa's village crafts with big ambitions". Africa Report. Retrieved 22 May 2014. ^ Dziadek, Francesca (8 December 2011). "Sant' Ambrogio's street festival". The Guardian. Retrieved 22 May 2014. ^ Blair, Elizabeth (Dec 13, 2012). "Etsy Crafts A Strategy For Staying Handmade And Profitable". NPR. Retrieved 22 May 2014. ^ "Handicraft industry needs to adopt technology". Economic Times of India. Feb 22, 2014. Retrieved 22 May 2014. ^ "Retail Sales: Tourists, Travelers". 2013-04-25. Retrieved 22 May 2014. 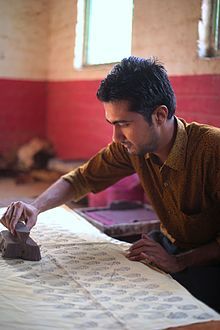 Wikimedia Commons has media related to Handicraft. Look up handicraft in Wiktionary, the free dictionary. This page was last edited on 14 April 2019, at 13:52 (UTC).